We were all wined and dined in fine Quail style as we studiously viewed the precious and still raucous 1951 and 1957 F.B. Mondial GP winning machines—the actual race bikes restored in arcane Italian race shops to perfect, original fettle and fairing, and damn the cost. Remember the Italian racing marque Morbidelli that offered a jewel of a V8 sport touring bike in 1997 for only $100K? 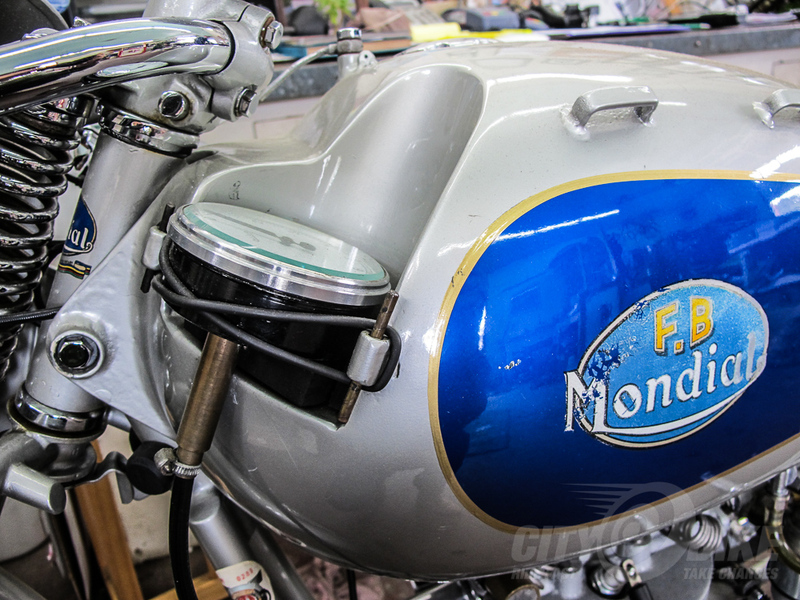 Well, that gentleman helped owner John Goldman with the Mondial restorations. The machines were both started for the crowd, and the rare sound of moto history moves true believers as one feels the sound and fury in your gut. Mr. Goldman’s display provided large photographs of the actual vintage races in Italy depicting the long gone scene. The tie to the vintage era remains strong and quite valuable. 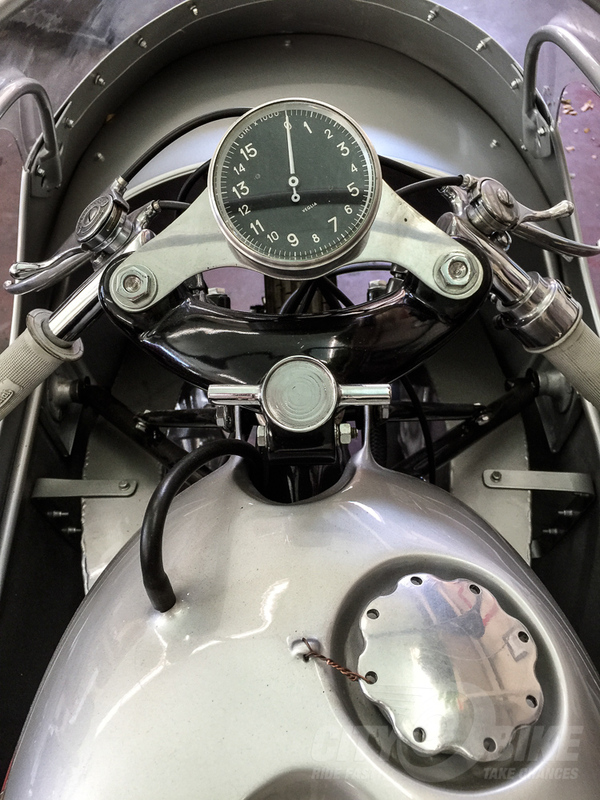 San Francisco architect and historic Italian racing enthusiast John Goldman has an exceptional moto collection, including the largest number of significant F.B. Mondial racing machines in private hands. 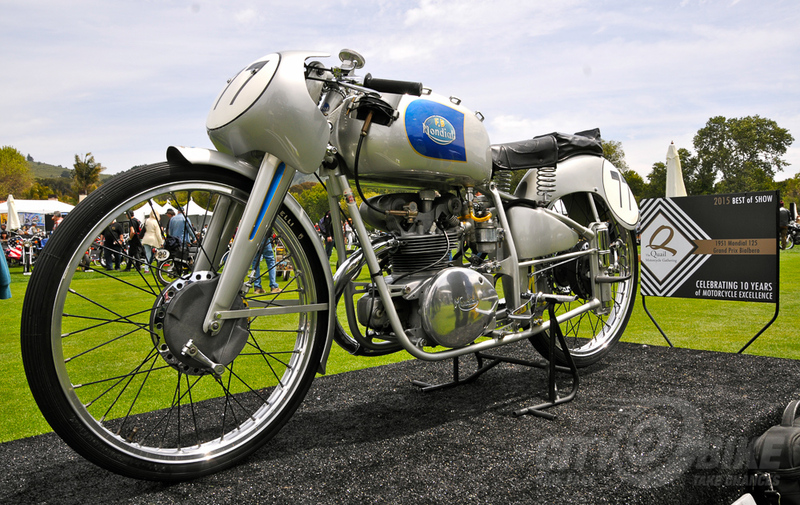 John’s original 1951 Mondial 125 Grand Prix bialbero, ex Carlo Ubbiali, won Best of Show at the 2015 Quail, and what a diminutive and perfect beauty it is. His 1957 Mondial 250 Grand Prix bialbero, ex Torquinio Provini, won Best of Show at last year’s Quail, resplendent in its original dustbin fairing. John brought both of these rare race machines back to The Quail this year for the unique display of ten years of Best of Show bikes. John has been collecting Mondials since 2001 and has researched them quite extensively, on multiple continents. 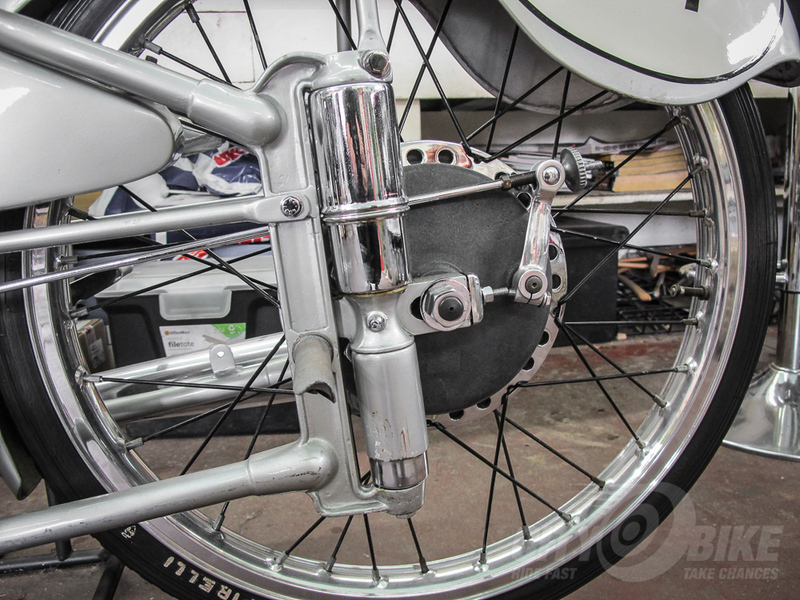 He discovered there’s been much incorrect information published, not to mention that many purported original Mondial Grand Prix bikes in collections are either replicas or fakes. For example, there are more 1957 Mondial 250 GP bialbero bikes in the world now than were ever produced by F.B. Mondial. Good to know, especially when you go to auction with a briefcase full of Franklins in search of rare, often undocumented original equipment. John chose Point Arena’s Zen House for preparation and fettling. The Zen team have extensive European moto experience, and a visit is worth the twisty ride north. Long gone F.B. Mondial kept almost all their Grand Prix bikes at their factory in Italy until 1977, when three Italians pooled their resources to buy all the Mondial race bikes. In 2001, they were again put up for sale, and John was able to secure the ones he desired. Mondial was founded by industrialists, the brothers Boselli (F.B.) in 1929. They raced successfully in the dim days of early European racing, when just about all small displacement bikes were two strokes. The factory was destroyed in WWII and re-opened after much hard work in 1946. They made affordable utilitarian three-wheelers, perfect for transport during the desperate post-war years. In 1948 an engineer friend designed a then-radical bevel shaft driven 125cc four stroke engine with twin overhead cams. The cases weren’t split in two, but rather cast as one piece with open sides. F.B. bought Engineer Drusiani’s design, and in a world of two strokes made one of the first four stroke race bikes and changed history. They proceeded to accumulate world records in the 125 and 250 classes, and in 1948, Nello Pagani won the Grand Prix at Monza, out-performing the two strokes handily. 1949 was the first year of the Grand Prix World Championship as we know it. Mondial won every 125 GP race in ’49, 50, and ’51, besting major rivals Morini and MV Agusta, who both campaigned two strokes. So the Mondial factory got lots of attention, dominated the class, and forced the other factories to build four stroke engines so they could keep up. They were “World Champion Constructor” in 1949 and 1950, and in 1957 introduced their 250 DOHC bialbero and won the series with Cecil Sandford riding and right behind him was this 250, ridden by Provini. Mondial also won Constructor’s Championship that year. Diminutive (think Pedrosa) and colorful Carlo Ubbiali, Rossi precursor, won in ’51, and was also the most successful GP racer of all time in 125 and 250 classes, winning nine world titles. And no, these now-small displacement bikes were not easy to ride nor win races on. They were masterpieces of compact engineering and breakthrough developments, still viable in this ‘traction-controlled’ day. Their racing credentials were astonishing. By ’52, MV Agusta had caught up with Mondial, and lured Ubbiali to its team in ’53, the year Fabio Taglioni joined Mondial, working under engine designer Drusiani, the father of the 125 double overhead cam engine, now with a vertically-split case. Also that year, Drusiani jumped ship to found his own company, Moto Comet. Mondial had a very rough time when he left, but he fortunately returning in ’56 after his Comet fell to earth. Taglioni later went on to achieve great success and fame with Ducati. Drusiani’s first project back at Mondial was the 1957 250cc DOHC engine that won four races that year, ridden by Provini and Sandford. MV won two. 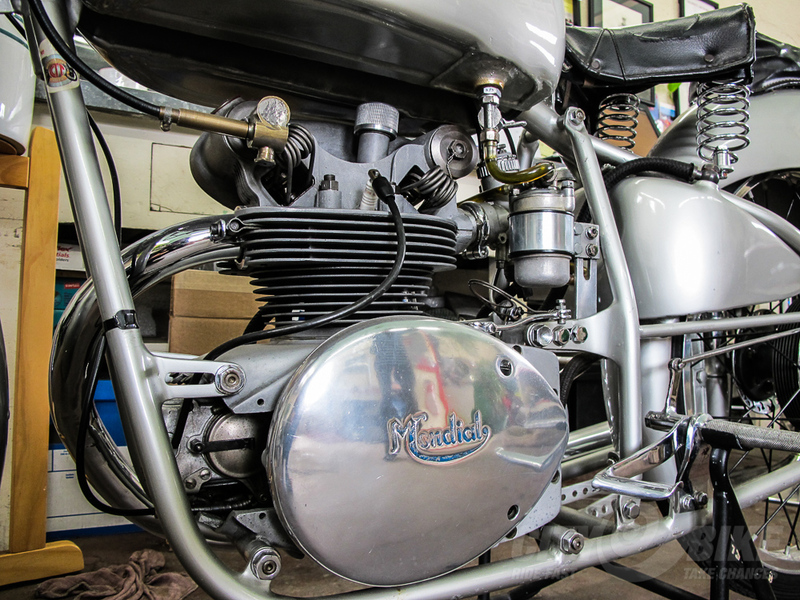 Owner and restorer John Goldman painstakingly researched the history of both bikes and their lengthy list of race wins. 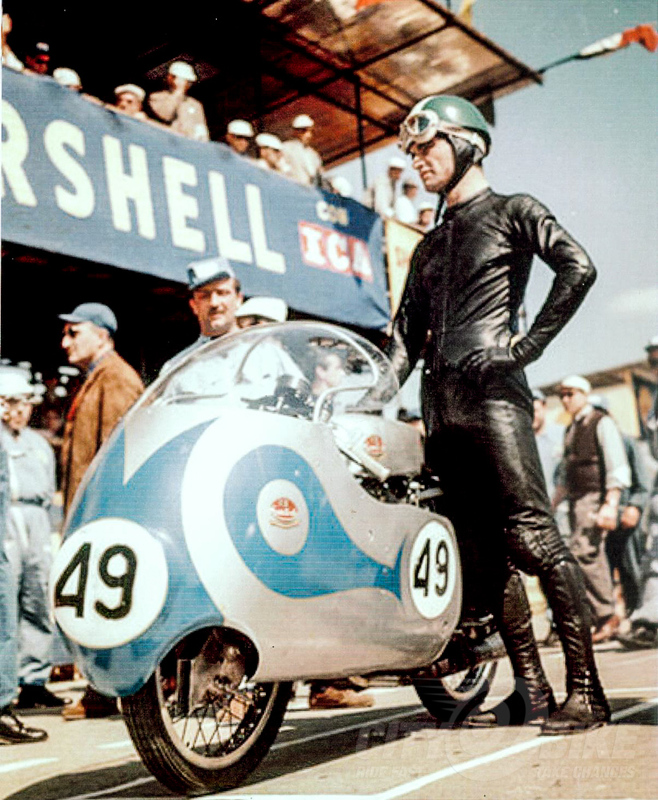 In 1957, Mondial won both 125 and 250 World Championships with Provini on 125 and Cecil Sandford on the 250. Provini was second on the 250 and Sammy Miller third—stunning results for a team that barely had a presence in the 250 class prior to 1957. After the season, Mondial, Moto Guzzi, and Gilera left racing due to high cost, leaving MV Agusta to dominate GP for years to come. 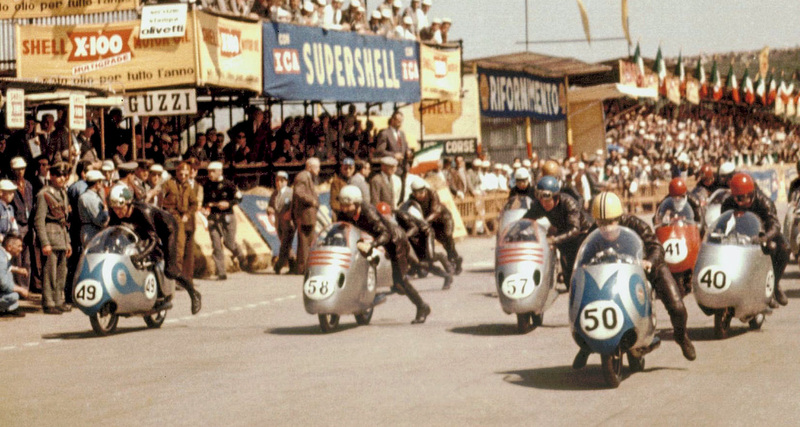 Young Mike Hailwood raced a Mondial in ’58, ’59 and ’60 after his dad bought two expensive factory Mondial 250s. In 1961, Hailwood found his way to Honda who dominated until Yamaha won with Phil Read in 1964-65. The F.B. Mondial company, a revered GP-winning marque, ceased doing business on New Year’s Day in 1980. Investors attempted to revive the name, but it was not to be. Thanks to serious historian collectors like John Goldman, these treasures have been returned to mechanical glory for untold sums, and now contribute to a favorite aspect of the Quail Motorcycle Gathering: the breadth of history, art and two-wheeled glory parked on that fastidiously tended lawn. Will is the former editor of On The Level, the BMW Riders Association’s members-only mag. He resides in the waaay North Bay, where he terrorizes remote twisties on a variety of Boxer-bikes. This story originally appeared in our July 2018 issue, which you can read in all its original high-res glory here.